Congrats to Gilles and Nicolas for their new paper! Our team demonstrates for the first time that the controlled orientation of silylated hybrid-temporins on titanium surfaces could improve antibacterial activity of the material. 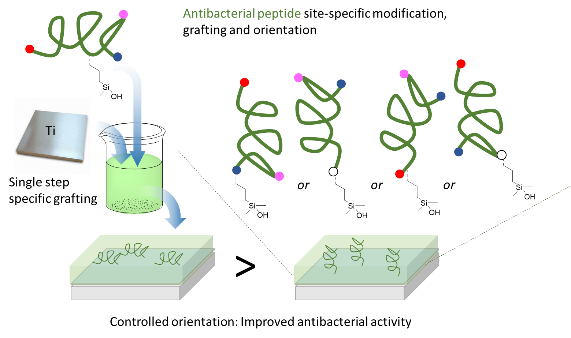 In collaboration with Dr Vincent Humblot (UMR CNRS 7197, Paris) and Pr Ahmad Mehdi (Institute Charles Gerhardt, Montpellier), we designed 5 analogues of the antimicrobial peptide temporin SHa and studied the impact of the site-specific and orientation of the peptides on the antibacterial activity of the grafted titanium device. This work is published in J. Mater. Chem. B (DOI: 10.1039/c8tb00051d).